Getting children to sleep can be exhausting – especially when for whatever reason they aren’t able to settle themselves down enough to fall asleep. Maybe your routine has changed. Or the dreaded daylights saving time happened. (was that invented just to torture parents?) Whatever the reason, it’s tough. I’m writing this as my two youngest are having difficulties settling down. My middle son always has a difficult time whenever change happens and he recently changed rooms. So, we’ve had 2 weeks now of him not being able to calm down until super late at night. When he is up, his brothers tend to stay awake as well. Here are some ways to help your child calm down, relax and hopefully fall asleep. I’ve found making sure bedtime goes smoothly starts several hours before bedtime. Making sure the kids eat enough food at dinner, get enough exercise during the day and mental stimulation. Both their body and mind need to be tired to get them to fall asleep quickly and easily. It’s a good idea to make sure all the reasons they might have for getting out of bed are taken care of. A glass of water on their nightstand, making sure they go to the bathroom as the last thing before heading to bed helps to minimize the excuses to get out of bed. A bedtime routine is great – where you do the same things, in the same order each night. In my kid’s case, they have their bedtime snack, then go brush teeth, floss, go to the bathroom and change into PJ’s. Then, it’s upstairs. Most of the time I read a book (or several books) to them. Sometimes they play with clay or legos while I read or lay quietly in bed. My oldest loves it when I read to him. Normally, we go upstairs a bit earlier than the younger two so we can get in at least a couple chapters from whatever book we’re reading read. Then, I get the younger two and read a couple picture books to all three kids. 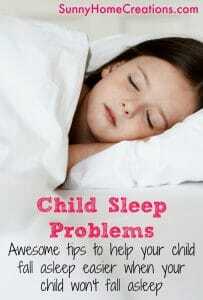 Here are some things to try if getting your children to fall asleep easily has become almost impossible. Try spraying magnesium oil on the bottom of your kids’ feet. Magnesium oil is supposed to help you feel calm and sleepy. This is the one we use. We spray this on the bottom of their feet and then make sure to cover in socks. Sometimes it can itch after it has been sprayed on, but my kids haven’t complained of any itching. Rub lavender essential oil into the bottom of their feet (make sure to cut the oil with another oil, my favorite is almond oil). My kids find it fun and soothing to do and both the magnesium oil and the lavender oil help to relax them and become sleepy. Diffusing lavender essential oil in your child’s room can have a calming effect and help them relax and fall asleep. You don’t want to continuously diffuse the essential oil though, instead, you want a diffuser that will intermittently diffuse, like this one. Sometimes, when I am changing the kid’s sheets, I will put baking soda mixed with lavender oil onto their mattress and put the sheet over this. Other times, I will put a couple drops of lavender oil on their sheets, under the pillow. When they lay down, they will get the relaxing benefits of the lavender oil. On nights when my kids just can’t lay down or they do, but it’s like their little bodies just can’t stop, I will play a guided meditation for them. You can find several of them on Youtube. A lot of times I will play them on my phone for the kids. The kids all really enjoy listening to these and they really seem to help them. Just giving the kids something to focus on, helps them keep still and they like to close their eyes and follow along to the meditation. Keeping their eyes closed helps with the falling asleep part. My oldest likes to listen to audiobooks to fall asleep. Sometimes he does manage to fall asleep while listening to the audio books, other times he ends up staying up even later because he becomes too engrossed in the book. Another way to help your kids relax is to rub their backs. My middle son likes me to not only rub his back, but rub his head too. He finds it relaxing and has fallen alseep many times with me doing this. On a very rare occasion, I will take my kiddos for a drive to help them calm down and we drive until they are asleep. I used to always fall asleep in the car and my youngest is the same. They have to stay still with their seatbelt on and they can look out the window. My youngest finds it to be an adventure and is very excited when we first get in, but within about ten minutes of seeing all the pretty lights, he starts to get drowsy and pretty soon he is asleep. My middle son sometimes doesn’t fall asleep in the car, but when we get home, he is calmed down and relaxed enough to fall right to sleep when he gets in bed. My middle son has a lot of issues with dairy. it wasn’t until recently that we put together that when he has dairy, he has a lot harder time falling asleep. I was talking to my cousin the other day and she said she has the same problem. You might find your child has the same problem. This is actually one thing we haven’t tried….yet But, there are crystals that are supposed to promote getting a good night’s sleep. These crystals include: howlite, amethyst, mangano calcite, lepidolite and clear quartz. Try giving a warm bath with some Epsom salts in it. The Epsom salts have magnesium, which helps to fall asleep. If you liked this article, please “PIN IT”! My middle son has had serious issues falling asleep for the past several months. (I have 6 kids – 3 boys and 3 girls ranging from 21 years down to 8 years) The diffusers were something that I was recently introduced to and I am so thankful that you included the scents that can help with sleep issues. I’m definitely going to make an order through my Amazon prime account! I’m also going to give several of the other options you listed a try as well, one night my son didn’t let me know he couldn’t fall asleep (I’d checked in on him multiple times and the last time he pretended to be asleep – although he really wasn’t), and he stayed up until almost 5 am. I was very upset about it but I felt horrible that he didn’t want to tell me that he just couldn’t fall asleep for some reason. I truly hope that your ideas will help! Thank you for writing this post! Best wishes to you and your family!